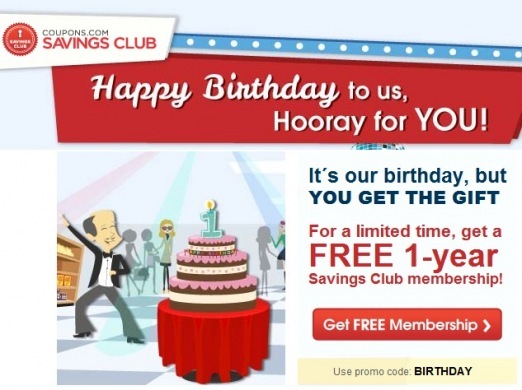 One year ago today coupons.com started their premium membership option called Savings Club. This membership is usually available for $30/year. But today, in honor of their 1 year anniversary, coupons.com is giving away FREE memberships to the Savings Club. If you plan to use coupons.com for your coupon printing needs (which most all couponers DO) this is a great promotion to take advantage of!! Typically, Savings Club Members have access to higher value coupons that non-members. As a sidenote, I do want to mention that the site does ask for your credit card information in order to auto-renew your membership after the first year. However, I still think this is a deal worth taking advantage of. Perhaps you could setup a reminder on your calendar for next August to cancel? Just an idea. I personally have a premium membership to coupons.com and have been able to score some great moneymaking deals with the higher value coupons available! « Holiday Weekend ~ No Coupon Inserts! !